I use traditional wet felting, modern needle felting and nuno felting (wool felted to fabric) to create one of a kind wearable art. This is the beginning of a 'cave girl lace' scarf which uses locks of unprocessed wool. I love the sculptural aspects of 3D feltmaking. 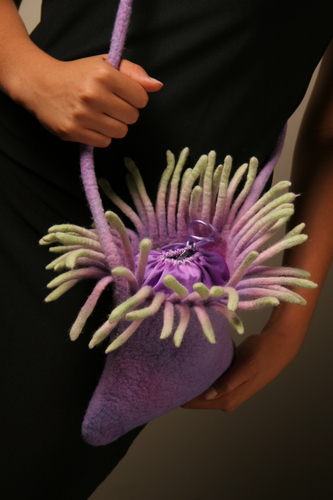 This 'Sea Anemone' bag was felted in one piece (except the silk drawstring insert) and won second prize in the "off the beach" multi-media Community Art Show. An example of my interpretation of nuno felt (also known as laminated felt) are my Gossamer Tops using wool fiber and silk fabric. 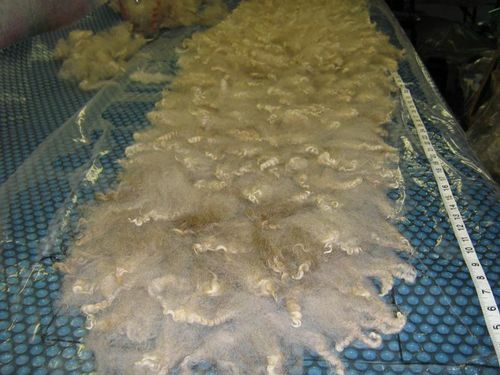 This technique makes use of the wool fiber's ability to migrate through the fabric fusing the two together in the final felt. This modern marriage of felt and fabric allows for exceptionally lightweight and flowing garments.